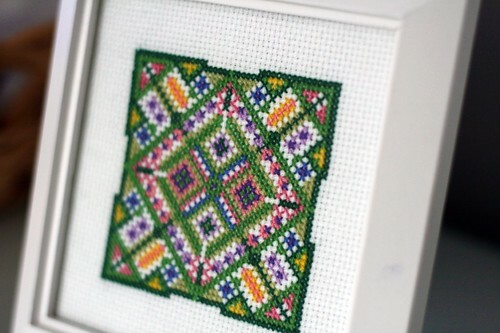 #13: Finish those damn cross stitches for my mom already! 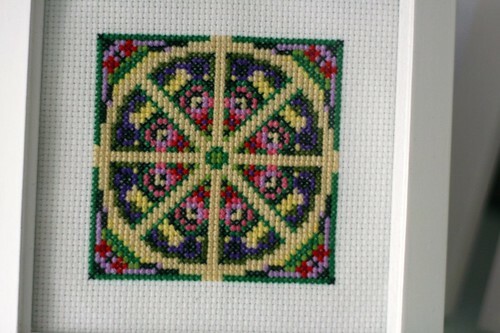 For her birthday in 2006, I made my mom a small square cross stitch. 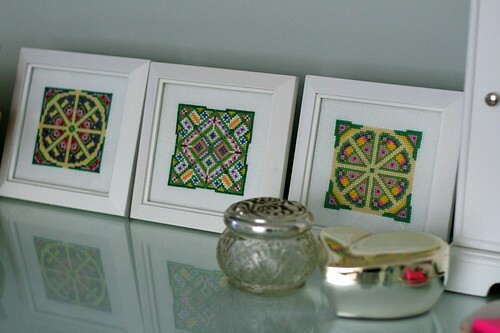 It was an Elizabethan knot garden and I got it from a book of traditional cross stitch motifs that I bought when I first became obsessed with the immediacy of cross stitch as a hobby. Of course, that small cross stitch took significantly more time than I ever expected, but it turned out so cool and my mom was really happy with it. I surprised her in 2007 by making another Elizabethan knot garden and revealing that it would be a trilogy, and very soon. And then I sort of got tired of working on such intense, detailed stitching projects (compared to my usual fare!). 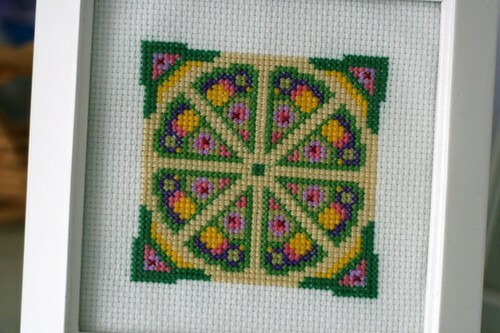 But I wanted to finish the set, especially after my parents redecorated their bedroom and the colors worked perfectly with the little cross stitched gardens. So when I wrote my list of things to do while I was 27 in the summer of 2008, I made finishing (okay, starting and THEN finishing) the last garden #17. And it just didn’t happen. My mom eventually stopped asking about it, and I felt bad. So when I put the same task on my list of things to do while I’m 28 this past summer, I really meant it. I mean, cursing on my list? GASP. But secretly, I started working on it. And I finished it and succeeded in not taking or posting any photos of the finished project so as not to reveal the surprise. And my mom was surprised, and super happy, and she didn’t even make any comments about how it took three years to get all three. And now they live happily on her dresser, and even though they’re deceptively difficult to get a crisp photo of, they look pretty awesome if I do say so myself. This entry was posted in 28 to do list, crafts, photography, tales of my own stupidity. Bookmark the permalink.